The Tides of Vengeance are fast approaching in World of Warcraft, bringing with them a cornucopia of new mounts to collect. I don’t remember a patch that has added quite so many at once though. We’re looking at 27 new mounts! The new mounts drop across all facets of the game — and they’ve even added the promotional Meat Wagon from pre-ordering the special edition of Warcraft 3: Reforged. Wowhead has the full list, but we’ll take a quick peek at a couple of the more outstanding mounts. Hope you packed your swimsuit because we’re going on a tropical island getaway. 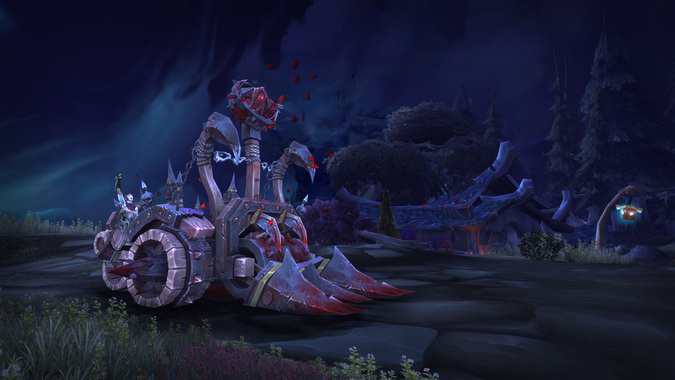 Island Expeditions wind up with six of the new mounts, including two that are sold for Dubloons. If you’ve been jealous of your friends who’ve gotten one of the amazing Parrots to drop for them, be jealous no more! Now you can buy your very own Siltwing Albatross for the low low price of only 1000 Dubloons! It’s going to take you a while to earn that many coins — luckily there’s plenty of new mounts to get along the way, including a couple of twists on Legion’s paragon mounts. The stand out is the Island Thunderscale. I’ve wanted to ride one of these Storm Drakes since the moment I laid eyes on them in Stormheim. I still go back and complete world quests there when the Valarjar are the emissary. Tigers and bats and brains, oh my! If you’re more interested in the vengeance part of Tides of Vengeance, the Darkshore warfront has you covered in spades. 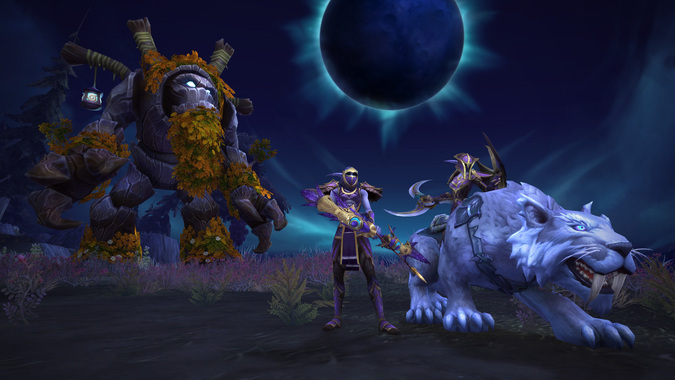 Horde players can get their hands on a Nightsaber for the first time, while Alliance players can finally ride a Kodo — let the cross faction transmog contests commence! Everything’s not all sharing though, the Alliance get to ride one of the fiercest Nightsaber mounts I’ve ever seen. The Priestess’ Moonsaber packs some beautifully ornate armor and a mean looking glaive on the back that screams “Get out of my way Horde filth, or you’ll be half the Orc you were a second ago.” If you want to mount up on that Moonsaber, you’ll have to help out the War effort. You’ll need to complete daily quests — a lot of daily quests — to earn 750 7th Legion Service Medals. Horde will have to be content with getting a Bloodthirsty Bat. The Krolusk mounts that each faction can buy are tempting, but I know I would be saving up for 1000 pounds of pure feline power. The Hivemind will also be available with this patch. The Secret Discord has been pondering this one for a few months now. Developers Celestalon and Jeremy Feasel added fresh fuel to the fires over the weekend with a series of tweets. Jeremy lead with this picture of Azeroth surrounded by tiny hiveminds and a curious Tel’abim Banana down in the corner. Celestalon was quick to add a weird set of numbers and letters that couldn’t possibly mean anything — could they? Finally, Jeremy followed that up with what seems to be a nonsense statement, I mean what does “A Brie Duck Clarifies Hunger, Like Hi Rune” even mean? I’ve been watching the Discord sleuths all weekend throwing out amazing theories and trying different codes. It’s quite fascinating the amount of work that goes into hiding and solving these puzzles. I didn’t even talk about the new Goblin Mech, or Chimera, or even the Frog mounts that are coming in the patch. There’s so many that are so great, I can’t wait to get them in my stable! Which are your favorites? Are you going to join in the fun on the Secret Discord?